Fences and decks are an important aspect of your property’s exterior appearance so it’s important to keep them in a state of good repair. The best way to ensure this is to hire a reliable company that knows how to install, repair, and maintain these structures. At Custom Deck and Fence, we have been operating in this industry since 2002 and specialize in exterior wood structures. We have experience with all kinds of exterior wood installations like decks, fences, pergolas, etc., and will make sure they look as good as new. 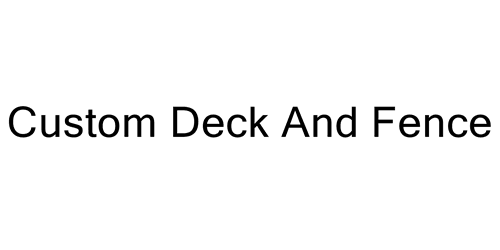 How Can Our Austin Deck Company Help? • Repair – Fence and deck damage should be repaired promptly because they can worsen from exposure to the elements. For example, a small crack in the deck finish can compromise its structural integrity after being exposed to rain or sun. We will promptly fix the problem and ensure your wooden structure is as good as new. • Installation – Installing structures in an exterior environment can be tricky because you need to use the right techniques and materials. As an established Austin deck company, we know how to securely install all kinds of wooden structures like decks, fences, and pergolas. We will make sure these installations stand the test of time. • Cleaning – Wooden structures can become dull and dirty over time. Debris, grime, mold, mildew, etc., can easily ruin the appearance of these exterior installations. We use expert power washing to remove all of these problems. This is a quick and effective method to clean wood without damaging it. Our team will use the right water pressure to remove even the most stubborn surface stains. • Staining – If your deck or fence looks dull even after a thorough clean, we recommend staining. This will enhance the beauty of wooden structures while extending their lifespan. Stains form a thin barrier between the wood and outdoor elements, providing some protection from sunlight, moisture, rain, cold, heat, etc. Our team will apply stains evenly to make sure these structures look good.